Few exclusive lodges offer the immersive tranquility of Lettery Lodge. Gazing upon the mist ringed peak of Ben Lettery this luxury retreat provides world class comforts in a landscape like no other. 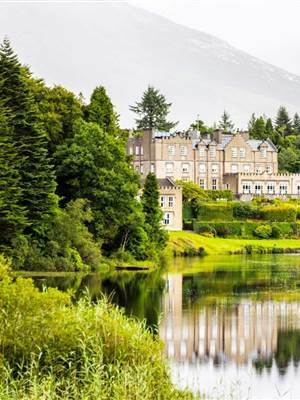 Offering privacy and luxury with 700 acres of private estate to explore and Ballynahinch Castle just next-door, guests can be as secluded or as sociable as they choose. Enjoy private family dinners in the lodge, prepared in your own state of the art kitchen or reserve a table in the beautiful riverside restaurant or atmospheric pub in the castle. Days may be spent in quiet reflection or full of activity provided by the Castle’s experienced guides. 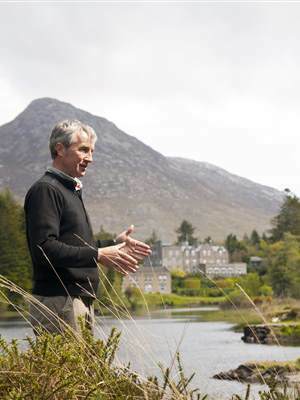 Bike riding, fly-fishing, hiking, lobster-potting or even a shooting masterclass from the master instructor on site. You set your own pace at Lettery lodge. 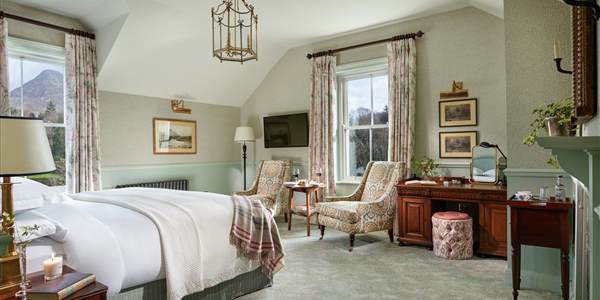 This five bedroom lodge only one minute walk from the hotel reception is ideal for those looking for extra space and privacy while enjoying all the comforts of the hotel & estate. The ground floor master suite enjoys magnificent views of Ben Lettery with a dressing room and en suite with a freestanding bath tub and separate shower. Upstairs has four superior rooms which can be twin or king, all en suite with large walk in showers. The lodge also enjoys a fully equipped kitchen with dining table, dining room, a lounge with open log fire, a games room with billiard table and a yoga studio overlooking the mountain. For availability and rates enquire here.